The Fluidic Verna, when launched was very successful, being fully loaded and offering a diesel version, something that the Honda City didn’t have at that time. Over the years though, the Verna has begun to show its age and with the Ciaz and City now up to date, the Verna is facing stiff competition. The new Verna will be stlyed similarly to the one that is on sale in the international market. The new model will have styling which is different from the outgoing one. For starters, it too will have a split tail lamp cluster, something that we are seeing on most new Hyundai’s Xcent and Elantra. It has a new headlamp cluster up front with LED DRLs (as can be seen in the picture), new alloys, a new bumper and a larger grille. 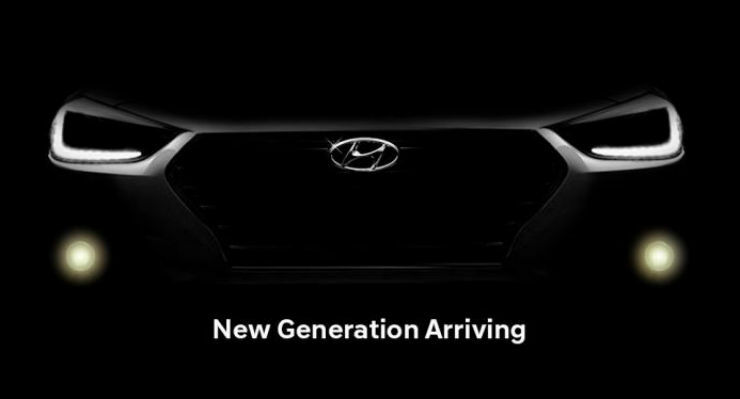 The grille will similar to what is offered on the new Hyundai products. Under the hood, the engines are expected to be the same that are on offer currently. We will have the 1.6 liter diesel (126 Bhp and 259 Nm) and the 1.6 liter petrol engine (121 Bhp and 155 Nm), in addition to the 1.4 liter diesel (89 Bhp and 220 Nm) and petrol (106 Bhp and 135 Nm). Both manual and automatic gearboxes will be on offer too. The Verna may also be the first Hyundai to receive a mild hybrid system, using a generator, similar to what is on offer in the Ciaz. While this has lost its FAME subsidy, it will continue to benefit from lower excise duty.